Not that much to say here really because there is not much that can be written about a ready made picture frame to make it sound glamourous...!! !.....although we shall summarise! Many frame retailers both on the High Street and online suggest they are the cheapest and offer the best discount. Well you have a scout around then come back to us for the best deals on your next standard size ready made picture frame. You decide. Our pricing structure is fantastic and discounted already, so when we have a ready made frame promotion such as 3 for 2 or BOGOF (buy one get one free) they really are genuine great offers that are unbeatable, and will save you a shed load of cash! As a guide to our discounted pricing structure, a quality A4 size frame suitable for a certificate or diploma in a 30mm wide frame moulding starts around the £5 mark. 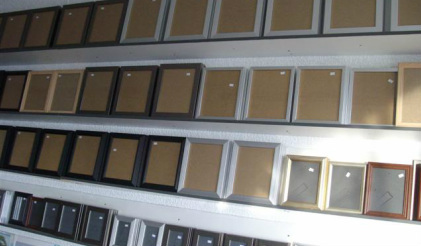 Whether you require a single frame a few frames or hundreds of frames contact us today for a quotation. Sample frame guide. Please note our range alters all the time.